Meathead Movers is here to take care of the heavy lifting for you on your move to Larkspur. Our clean-cut student athlete movers are ready to get you safely settled into your new Larkspur home. Welcome to Meathead Movers of Larkspur! If you are moving to or from anywhere in Larkspur, we are the moving company for you! Our professionally trained student-athlete movers and our moving concierge service are here to help you with every stage of your move in Larkspur. Located in beautiful Marin County, Larkspur is a small town dedicated to its residents. With its strategic Bay Area location, San Francisco is just a short drive or ferry ride away. Residents will love exploring Larkspur’s numerous parks or taking a stroll along the bay. Larkspur Landing and Larkspur’s historic downtown area, give residents many shopping, dining, and entertainment options. Residents can also enjoy a weekly farmer’s market every Saturday morning at the Marin County Mart. 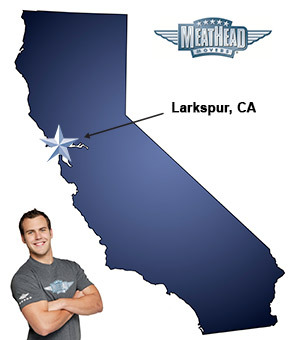 If you are considering moving to Larkspur, Meathead Movers is here to help! Our moving company specializes in local, long-distance, and commercial moves to, from, and within Larkspur. We also provide reliable packing, storage, on-site relocations, and our distinctive moving concierge service. All our student-athlete movers are thoroughly screened and trained before their very first move. With branches not just in Larkspur, but all throughout California, we are your one-stop resource for all your moving needs, no matter where your California move takes you. In fact, you can see what your neighbors in Larkspur have to say about us. With our 100% satisfaction guarantee, the only thing you have to lose is the stress that comes from moving! So contact us today for a free moving quote and to learn how we can help you on your next move! Moving to Larkspur? Here are some helpful resources. “I just recently moved from Southern Ca to Northern Ca, I had two pick-up points within 5 minutes of each other. The movers were efficient & professional with a spirit of co-operation making this move far easier & more pleasant for me. mindful of any potential obstacles created during the move-in. Excellent rating. I just recently moved from Southern Ca to Northern Ca, I had two pick-up points within 5 minutes of each other. The movers were efficient & professional with a spirit of co-operation making this move far easier & more pleasant for me. When unloading at the destination they placed items allowing easy access & unpacking. I provided a floor plan identifying furniture placement & was pleased they actually followed those instructions closely. The movers were pleasant, quiet & mindful of any potential obstacles created during the move-in. Excellent rating. I would feel most confident hiring Meathead Movers in the future & continue to share my enthusiasm with others. Thank you.